Just upgraded to Windows 10, and started to update it automatically. But later on it got stuck by saying Error Code 0X80246008. 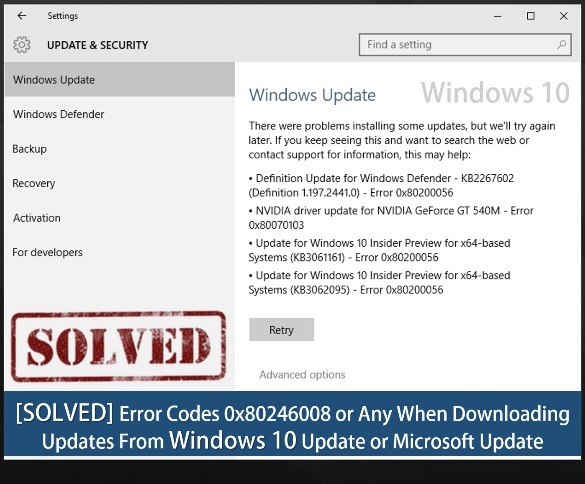 Learn how to fix Windows 10 update install error and other similar errors. Previously we have seen the Problem ofRestart Loop Error After Update To Windows 10 and its solution. It was helpful for lots of, but suddenly another error comes into picture in updating Windows 10. And this tutorial will tell you how to get rid of this error. After installing the latest build for Windows 10, you might experience an issue where a new Build shows available, but when you attempt to download and install, it gives an error message with above mentioned codes. You can find the error code for the failed update by viewing your update history. Not able to download any updates or use the Windows store since installing Windows 10 by means of getting message of Windows 10 failed to install error Code 80240020 or 0X80246008 or 0x8024001e or KB3074683 or KB3001652 or X80246007 or any code. If you receive error when you download updates from Windows Update or Microsoft Update, you might need to restart the Background Intelligent Transfer Service (BITS) or the Windows Event Log service. Open Administrative Tools from Control Panel >> Services. Background Intelligent Transfer Service >> Right-click the Background Intelligent Transfer Service (BITS)service, and then click Properties >> General tab, next to Startup type, make sure that Automatic (Delayed Start) is selected. Next to Service status, check to see if the service is started. If it’s not, clickStart. Then find Windows Event Log service >> Right-click the Windows Event Log service, and then clickProperties >> General tab, next to Startup type, make sure thatAutomatic is selected. If you getting error go to next method to start BITS shown bellow. If the FilesNotToBackup key exists, then skip to step. If that does not exist, we need to create key by following steps: Right-clickBackupRestore >> New >> Key >> Type FilesNotToBackup and then press ENTER. Start >> Run >> services.msc >> Double-click Background Intelligent Transfer Service >> General tab >> click Start. What these error means is, your Windows 10 installation folder is either unfinished or corrupted. Now, how do you fix that? Go to “C Drive >> Windows >>SoftwareDistribution >> Download>> delete everything in that folder. Don’t delete DOWNLOAD folder, only its content has to be deleted. Locate BranchName and make sure it shows: FBL_AWESOME1501. If it doesn’t, change it. If there is no BranchName Then you need to create new key with that name and value shown. Locate ThresholdRiskLevel and change it to: low. If there is no ThresholdRiskLevelThen you need to create new key with that name and value shown. Select Microsoft SQL Server 2005, and then click Change. In the Currently installed programs list, select Microsoft SQL Server 2005, and then click Change. In the Component Selection window, select Database Engine, and then click Next. In the Feature Maintenance window, select Database Engine, and then click Next. In the Microsoft SQL Server 2005 Setup window, click Next. In the System Configuration Check window, click Next. In the Change or Remove Instance window, click Complete the suspended installation. In the Error and Usage Report Settings window, click Next. In the Ready to Update window, click Install. In the Setup Progress window, click Next. Now check your windows update… After this update has completed, open Windows Update and search for additional updates for your computer.